In the space of a singular calendar year, we have had two white Chicago critics use the n-word in a review. 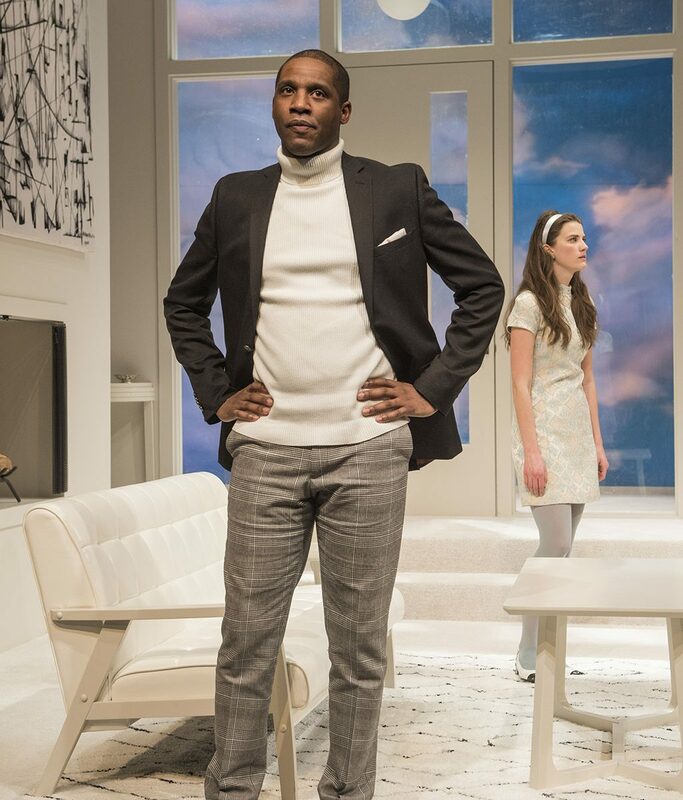 Yesterday Justin Hayford put this sentence in a review of Court Theatre’s Guess Who’s Coming to Dinner and legitimately thought it was a good idea: “At worst, it will leave him with a cracked skull, tormented children, and a wife who’ll come to believe he’s nothing but a n*gger.” (This is censored, the uncensored photo is below.) Now, I don’t know if Hayford wanted to get into a fight when he published this review, but I am a non-violent person and when I first read this sentence I was ready to throw hands. I immediately talked to some artists working on the play to get their thoughts. TRIGGER WARNING: The original text of Hayford’s review is below. Clark’s comments are particularly disturbing because as he deftly points out, this is about a general lack of respect for the subject matter that I would hope a critic who is in support of and in collaboration with their community would exercise. If you want to quote something with such incendiary language, use quotes the first time, but furthermore ask their public relations representative for the script! 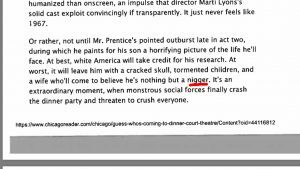 The actual line is: “And she’s the one gonna wake up mad one morning and call you a n*gger.” The Reader has tried to correct this by stating: “Editor’s note: During the play, one of the characters uses a racial slur. We have updated the text to show that the offensive language came directly from the script. We apologize for the confusion.” As you can see, not only is it misquoted, it is a failed paraphrase if it is meant to be so because these are entirely different sentiments: someone who will come to believe he is nothing but a n-word versus someone calling him the n-word in a moment of anger. My eyes scan the page, and go into double vision. Could this possibly be happening? Look up the writer. Maybe the Reader hired a black author and I had no idea. Nope, he’s white. Of course. On to phase 3. My chest tightens, my eyes widen, my fists clench and my heart starts to beat real fast as every time that word has ever been thrown into my vicinity without my consent by a colonizer flashes through my mind. I legitimately google whether this is a thing we’re doing now, if profanity is usually published unedited. Mind you – I own the very journal I am using to discuss this issue, and yet I still looked it up because this is what gaslighting looks like in 2018. According to the Washington Post, they use “common sense” and the Atlantic has a really handy guide for when to use racial slurs (pretty much never), but the overall answer from the internet is a resounding NOPE. We are not casually using the n-word in publication. I realize this writer has just said the n-word because he felt like it, that the line was nowhere in the play. This is an original thought that this young man is nothing but an n-word. So you repeat step 3, potentially with tears, and you begin to write your response. These are the five stages of rage that I went through while reading this article today. I am being more direct than I usually would be in writing this piece and I understand this article is angry. However, I have spent too much time reasoning for something that should be common sense. As the Atlantic guide says, don’t use a slur that isn’t yours if you’re not re-appropriating or deconstructing it. Black artists and their allies have organized through ChiTAC, we have appealed to your better nature, and none of it has worked. So, white critics of Chicago, I ask you. What will it take for you to respect your artists of color? Because continuing down this path guarantees you will lose respect, readership, and ultimately your jobs. I am a journalist. I want you to thrive, I want you to survive. But I cannot allow you to survive by standing on my back. Guess Who’s Coming to Dinner is running at the Court Theatre through April 15th. Learn more about the show by clicking here. I used to work with a mostly-all-white-staff in Minneapolis at a video game magazine as a critic in the ’90s. I’m first-generation Scandinavian (raised in upstate NY), which is to say that the odds of being anything other than severely white are pretty low. Being mostly something of a newsletter that evolved into what is still a major success (by what might appear to be a 100% accident – there was hard work – during before and after my time), we were caught off guard when people started calling us out for the video game industry junkets we would attend and cover without the slightest thought as to how that might cloud our integrity even though we panned almost everything anyway. So what if they took us out to jump out of planes or participate in demolition derbies or just wild expensive parties that didn’t really happen spontaneously in the wild. We made almost no money and had a rep for being the hardest critics to please, the easy critics were at the parties too, and everybody wanted to talk to us. So no. Journalistic training/integrity were not exactly off the charts at the time (they haven’t not-learned since). But that situation. A ridiculous, cloistered, 20-something, all-to-mostly-white writers in my years there; a brash, cocky, neck-deep-in-hubris situation. And I cannot imagine how something even remotely like this could have gotten past our editing. And I mean editing, not editors. There were 5 of us when I first got there. There was one editor and he didn’t have enough time to read everything. So we passed stuff around before publication and called each other out on stuff that was typically at its worst, crass. Then moved on to grammar. We cut stuff sometimes but nothing in my memory as blatantly stump-dumb-blind to other people’s pain as what the Reader failed, repeatedly, to put an end to today. I lived there for four years. Minneapolis is the most passively-aggressively-racist place that I have ever lived. Surely, The Chicago Reader can do better than this. I’d expect no less of City Pages. That this happened, in Chicago, is horrifying. It is dangerous to tell critics which words to use or how to frame their critiques based on their race, ethnicity or gender. The next thing you’ll be requiring is that white reviewers not be allowed to review plays by black playwrights, men plays by women or even vice versa. You might even go further and suggest that white playwrights writers of screenplays not be allowed to write white characters who use the word “n—-r” despite the realism they are seeking to evoke. I understand the pain that the word evokes in black people; I feel the same way, as a Jew, when I hear the word “k–e.” I imagine that Latinos despise hearing “s–c” and gay people “f—-t.” It is never right for people to use these words against each other or to refer to the groups in question using them. But to expunge them from all discussion and critical speech or to start sanitizing them by substituting phrases like “n-word,” “f-word,”‘k-word” seems the worst kind of censorship, one that may come back to haunt the very groups espousing it. When I am not acting, I teach constitutional law and the First Amendment of the U.S. Constitution protects the right of people of all races, ethnicities and genders to speak and write their minds as long as it does not constitute a direct incitement to immediate violence – regardless of whether folks are offended or their feelings are hurt. Be thankful that we live under this system. Read your history. It has over time helped the cause of the very marginalized groups who are seeking to suppress it now. Be careful what you wish for. “Wh*tey” may be next. Or will it be the “w-word” by that time? And as for the controversy over Hedy Weiss’s review of “Pass Over” last summer, that was another wrong turn the Chicago theater community took down the censorship road. Critics, whether black or white, are not here to give theater artists a safe space or make them feel good about about their work or themselves. They are there to call the shots and critique the play as they see fit, coming as each of us does from a unique – and yes, sometimes biased – perspective. The theater community in turn should respond in a mature and responsible way, opening the opportunity for dialogue and discussion on all fronts. Blackballing a critic is not the way to go. It is time for Chicago theater professionals to grow up and stop the witch hunts. You are completely welcome to your opinion, however since you are using slurs that are incendiary and triggering and do not belong to your ethnic group I have redacted those as I have in my own writing. Posting this for the benefit of those reading the censored comment. It is my belief as a writer and an artist that if you have no cultural purchase over a slur and it costs you nothing to say or use it but has the power to hurt others, you should not do so. It costs you nothing to say them, and it costs you nothing to censor them either. In this case is may be wise to follow the attitudes of those who are affected by these words rather than use your privilege to lord it over them. I would not presume to tell you what slurs you should be comfortable with as a Jewish man. The precise issue with Justin Hayford’s review is that it lacked thought or specificity. It was not used in an understandable yet discomforting way, it was completely unnecessary. Just as it is unnecessary to view these words now in their entirety. Thank you for engaging!